DIY fever seems to be sweeping the country as homeowners are buckling up their tool belts and tackling projects around the house. Reasons for the phenomenon range from wanting to save a little money to a desire to achieve the rewarding feeling that can come from working on one's own home. If you're planning on joining this growing group of self-sufficient homeowners by doing your own siding installation, fiber cement can be a good choice. However, if this is one of your first home improvement projects, care should be taken: you don't want to add medical bills to your fiber cement cost. Fiber cement is heavy. The material weighs quite a bit more than other sidings such as wood or vinyl. When working on a ladder, you may need a helper on a second ladder to assist with longer pieces. You don't want to risk being thrown off balance and possibly falling. Don't breathe the dust. It's called fiber cement siding because it's actually made of cement. Always cut the material outside where the hazardous dust dissipates into the atmosphere rather than your lungs. Use a special saw blade. Trying to cut the material with a blade designed for wood can dull the teeth and even cause your power saw to kick back unexpectedly. Use a blade made specifically for fiber cement siding. 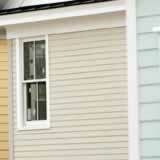 Installing your own siding can be a great way to get a little fresh air and save some money. Just be careful while working: A trip to the emergency room can really escalate your fiber cement cost.